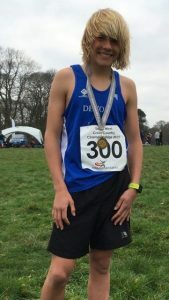 Last weekend two young Okehampton runners, Molly Marvin and Sam Priday, who train with Okehampton Running Club, took part in the Devon Schools X-Country Championships held at Stover School. Both of these runners have been having a good season, being well placed in their runs for the club at the Westward League X-Country races and having had successful runs at the South West X-Country Championships earlier in the month. This good form continued at this meeting with both securing places in the Devon Team at the South West Schools Regional Championships in Bath next weekend. Molly had 3,660 metre course to complete in the Senior Girls category where she finished in 8th place in 15.43, while Sam also came 8th in the Inter Boys class, running a 5,700 metre course in 21.16. Error: Error validating access token: Session has expired on Saturday, 20-Apr-19 03:20:42 PDT. The current time is Monday, 22-Apr-19 10:56:07 PDT.